On the completion of the railway line in 1898, there was an attempt to consolidate and expand coastal steamship services in Newfoundland and Labrador under the Reid Newfoundland Company, continuing the established practice of subsidized mail and passenger service to the outports. In 1923-24, in the aftermath of the Railway Settlement Act, the government took over the service and put it under the direction of the Newfoundland Railway. Coastal boat and ferry operations were assumed by Canadian National Railways in 1949, under the Terms of Union. From 1851, when the Colony took over the operation of the post office, the government let mail contracts for packet boats. By 1860 subsidized schooners were operating on the northeast coast from Greenspond to New Perlican, and along the south coast from Placentia to Channel-Port aux Basques. The first steam-packet, Lady LeMarchant, operated on Conception Bay after 1852. In 1860 the government decided to subsidize a regularly scheduled steamer service. The first vessel chartered to the service was the Victoria in 1862. In 1863 Ariel took over, alternating a northern run to Twillingate (later extended to Tilt Cove) with a southern run to LaPoile. In 1871 Grieve and Co. replaced Ariel with Leopard and Tiger, inaugurating northern and southern runs based at St. John's, to Battle Harbour in the north, and to Halifax in the south. After 1877 the two-steamer coastal service continued with Bowring Brothers' Curlew and Plover, while Lady Glover ran in Conception Bay. In 1888 Harvey & Co. took over the service, with Conscript (on the northern service) and Volunteer. The packet Hercules, then later Alert, began running in Placentia Bay, while Favourite ran in Trinity Bay and Lady Glover in Notre Dame Bay. Once the railway reached Harbour Grace there was no need for a steam-packet on Conception Bay. After Volunteer was lost in 1891, Harvey's commissioned Grand Lake and re-named Conscript the Virginia Lake. Meanwhile Farquhar's Harlaw served western Newfoundland, out of Halifax. 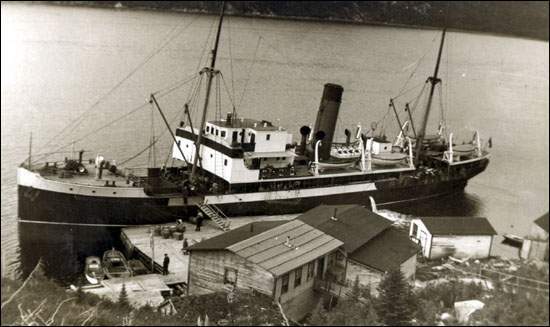 The Reid Newfoundland Company first became involved in steamship services with the construction of the ferry Bruce, which began running from Placentia (later Port aux Basques) to North Sydney in 1897. Built in Glasgow by the firm of A. & J. Inglis, the Bruce was the largest of a fleet of eight. The railway contract of '98 envisaged a coastal boat and ferry service integrated with the railway, all under the direction of the Reids, in return for an annual subsidy. The Reids anticipated diverting sea-going passengers and freight to the new railway line and operating the coastal service as a monopoly, but it was not to be. The original eight boats were known as the "Alphabet Fleet," and by 1900 included the Argyle (which operated in Placentia Bay, out of Placentia), Bruce, Clyde (Notre Dame Bay, out of Lewisporte), Dundee (Bonavista Bay, out of Port Blandford), Ethie (Conception and Trinity bays, coaling in Clarenville and Carbonear), Fife (Bay of Islands/Labrador Straits out of Humbermouth, lost in 1900), Glencoe (originally intended for the Labrador service, but soon diverted to Placentia and Fortune bays) and Home (St. John's-Labrador). 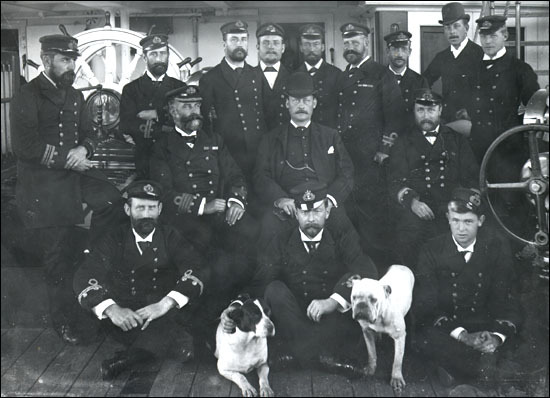 Officers and crew of one of the Reid coastal steamers, probably the SS Home. The Alphabet Fleet operated as a Reid monopoly for only a few years. 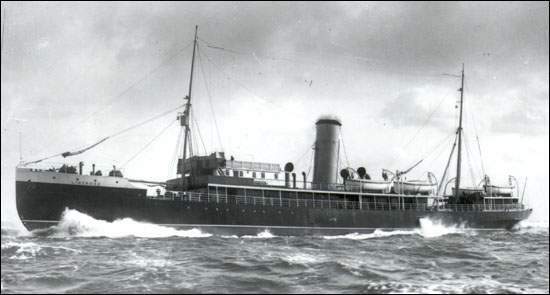 In 1904 the Bond government responded to complaints about the Reid service, and a deteriorating relationship with the Company, by subsidizing two Bowring vessels (Portia and Prospero) and re-instituting the old north and south routes. (Although all the steamers have since been known as "coastal boats" originally only the "outside" steamers were called coastal boats, the others being known as "bay boats.") In 1912 Crosbie's Sagona and Fogota were added as well. The Reids also added to the Alphabet Fleet in later years, acquiring Invermore for the Gulf run after Bruce sank in 1911, the legendary Kyle for the Labrador in 1913, as well as Lintrose and Meigle. Lintrose was sold to the Russian government in 1915, followed by the second Bruce in 1916. Fogota was sold in Europe and both Ethie and Dundee were lost in 1919. Added to the Reid Newfoundland Co. "alphabet fleet" in 1913. It was sold to the Russian government in 1915 and renamed Sadko. The Reids also supplied steamers to the spring seal hunt for a few years: the Virginia Lake (replacement for the Fife) went to the ice from 1902 until she was lost in 1909, and in 1905 the Company also supplied the Grand Lake. While it may seem incongruous that passenger ships would be used at the ice, some of Bowring Brothers' Red Cross Line, such as Stephano, were among the most successful sealing ships. Other coastal boats to have participated in the seal hunt include Crosbie's Fogota and Sagona, and an 1896 Governor's "excursion party" in the tiny Lady Glover. In 1925 the Newfoundland Railway, having been taken over by the government, experimented with supplying the Prospero and Sagona for the hunt. Under the Railway Settlement Act of 1923, the government purchased the remaining six of the Alphabet Fleet from the Reids, putting them under the direction of the Newfoundland Railway. The following year the Bowring and Crosbie boats were purchased outright and a new Gulf ferry, Caribou, was also commissioned (operating in 1925). The fleet was not added to again until 1936, under the Commission of Government, when Northern Ranger replaced Prospero. In 1940 Portia and Sagona were retired and Burgeo and Baccalieu joined the coastal service. During World War II, 10 smaller wooden steamers were built at Clarenville and operated by the Newfoundland Railway in the fish and coasting trades. They were dubbed the "Splinter Fleet." Caribou was sunk by a German torpedo on 14 Oct 1942, with the loss of 137 lives. The last three coastal boats added to the fleet under the Newfoundland government were Cabot Strait (Gulf ferry), Bar Haven and Springdale. The Original Northern Ranger at Harbour Deep, n.d. Built for the Newfoundland Railway's White Bay/Straits of Belle Isle service, it travelled between St. John's and Corner Brook via southern Labrador 1936-66. Under the Terms of Union, ferry and coastal boat services were taken over by Canadian National Railways in 1949. As it was anticipated that improved roads would lessen the need for a coastal boat system, fewer new vessels were built: notably Bonavista in 1956, which replaced Kyle on the Labrador. The last of the original Alphabet Fleet (Glencoe and Kyle) remained in service until 1959. CN added a new auto-ferry William Carson in 1955, the coastal boats Hopedale, Petite Forte and Taverner in 1960-62, and the Gulf freighters Ambrose Shea, Patrick Morris and Frederick Carter in 1965-68. CNR established a separate unit for its ferry and marine services in 1973 (which became CN Marine in 1976 and Marine Atlantic in 1986). With the expansion of the Province's highways, coastal boat services were provided only to the south coast and the Labrador. In the 1990s the south coast service was replaced by a system of provincially-run ferries. In 2001 Marine Atlantic continued to operate the Gulf ferries and a coastal freight and ferry service to Labrador, with the Sir Robert Bond (which replaced the Carson on the Labrador after she was sunk in 1977) and a new Northern Ranger.